What a beautifully presented four bedroom semi-detached abode which would make an outstanding family home especially being within walking distance to popular schooling. Having been renovated to a high standard only last year, it really is a home you can drop your furniture into and not have to lift a finger for years to come! Boasting new uPVC double glazing, new boiler, gas central heating, new oak doors and it has been rewired throughout. Situated near to the amenities in Liscard including local shops, commuter links and public transport, also not too far from those available in Wallasey Village. 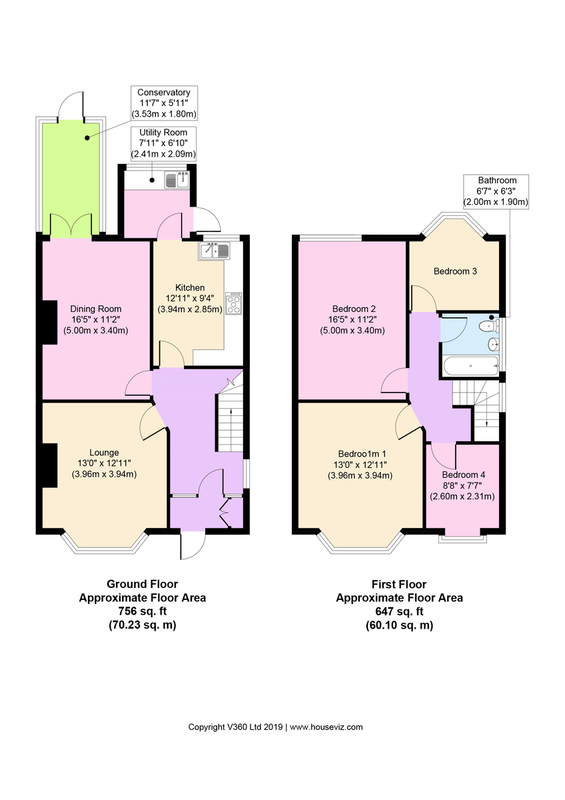 Interior: vestibule, inviting hallway, WC, living room, dining room, conservatory, superb modern kitchen and utility room on the ground floor. Upstairs there are four bedrooms and contemporary family bathroom. Plus a fully insulated boarded out loft. Exterior: good sized sunny rear garden with handy outbuilding being ideal for storage. Be quick in viewing this lovely family home! GROUND FLOOR WC Handy downstairs WC with a white suite comprising low level WC and space saver hand wash basin set within a handy storage unit with a waterfall mixer tap over. uPVC double glazed window to side elevation. Inset ceiling spotlights and wooden flooring. LIVING ROOM 13′ 0″ x 12′ 11″ (3.96m x 3.94m) uPVC double glazed bay window to front elevation with new insulation below. Picture rail, television point and central heating radiator. The focal point of the room is the feature cast iron living flame gas fire sitting proud in a stone surround. DINING ROOM 16′ 5″ x 11′ 2″ (5m x 3.4m) uPVC double glazed double opening patio doors that lead into the conservatory. Picture rail, central heating radiator and set in a modern timber surround off the chimney breast is a living flame gas fire. CONSERVATORY 11′ 7″ x 5′ 11″ (3.53m x 1.8m) An excellent addition to this family home is this uPVC double glazed conservatory which brings in lots of natural light through the surrounding windows. uPVC double glazed door opening out into the rear garden. UTILITY ROOM 7′ 11″ x 6′ 10″ (2.41m x 2.08m) Matching that of the kitchen, there is a base unit and wood effect work surfaces. Inset sink and drainer with mixer tap over. Space and plumbing for washing machine and dryer. Wall mounted Baxi combi boiler and laminate flooring. uPVC double glazed window to rear elevation, plus the uPVC double glazed door opens out into the garden. BEDROOM ONE 13′ 0″ x 12′ 11″ (3.96m x 3.94m) uPVC double glazed bay window to front elevation with new insulation below. Picture rail and central heating radiator. BEDROOM TWO 16′ 5″ x 11′ 2″ (5m x 3.4m) uPVC double glazed window to rear elevation with picture rail and central heating radiator. BEDROOM THREE 9′ 6″ x 8′ 8″ (2.9m x 2.64m) uPVC double glazed bay window to rear elevation with new insulation below. Picture rail and central heating radiator. BEDROOM FOUR 8′ 8″ x 7′ 7″ (2.64m x 2.31m) uPVC double glazed window to front elevation with central heating radiator. FAMILY BATHROOM 6′ 7″ x 6′ 3″ (2.01m x 1.91m) Tastefully fitted contemporary bathroom suite comprising deep fill bath with waterfall mixer tap, overhead shower and glass screen, low level WC and hand wash basin set into a handy storage unit with waterfall mixer tap over. uPVC double glazed window to side elevation. Ladder style radiator, tiled walls and tiled flooring. EXTERIOR To the rear of the property is a delightful sunny South facing garden that is absolutely ideal for spending time in over the summer months; either eating alfresco on the stone patio area or playing with the children on the lawn which offers well stocked surrounding borders. Brick boundary walls, external tap and side access gate. Access to the handy outbuilding. Paved for ease of maintenance the pleasant front approach is set behind a low rise boundary wall with borders. OUTBUILDING 22′ 1″ x 7′ 7″ (6.73m x 2.31m) Providing handy storage space in a home of this size. LOCATION Cliff Road can be found just off Marlowe Road approx. 0.3 miles driving distance from our Liscard office.